ONE of the unforgettable experiences to be had in California is to go whale watching in Monterey Bay. Nancy Black, a licensed marine biologist, is one of the scientists who lead these commercial outings, besides doing her own whale research. As Lawrence Biegel, her lawyer, tells it, one day Ms Black was in her research boat with assistants when killer whales attacked a pod of grey whales and killed a calf. Its blubber floated to the surface, and the killer whales were about to feed on it. Seizing this opportunity to film their behaviour, Ms Black threaded ropes through some pieces of blubber, then lowered a camera underwater. For this, Ms Black might now face up to 20 years in prison and half a million dollars in fines, after a federal grand jury indicted her this month. Little about the charges makes common sense. 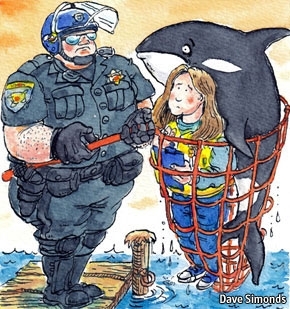 The federal law in question is the 1972 Marine Mammal Protection Act, which was intended to save dolphins, seals and whales from being killed and harassed. The law also banned feeding these animals, on the theory that doing so might compromise their ability to forage naturally in future. Feeding is what Ms Black is now accused of. She says she was using the protocols she had learned from the federal agencies that are now investigating her to observe a natural feeding that was already in progress. Just as ridiculous, says Mr Biegel, is the accusation, increasingly common in federal cases, that Ms Black lied to the authorities, which carries its own prison terms. Ms Black always edits the commercial videos of her whale outings to make them more interesting. When investigators demanded footage, she gave them one of these edited videos. Prosecutors now claim that she had tampered with evidence. To Harvey Silverglate, the author of Three Felonies a Day: How the Feds Target the Innocent, this is par for the course in America’s federal justice system today. A couple of trends have combined to threaten justice and liberty. First, federal statutes are often so poorly written and so vague that they are in effect incomprehensible. This gives excessive discretion to bureaucrats and prosecutors, with their own career ambitions, who apply them haphazardly. Second, federal law has been moving away from mens rea (guilty mind), a common-law tradition that suggests that a person who had no idea he was breaking a law should not be accused of doing so. With bloated federal legislation and without mens rea you can accuse most people of something or other, says Mr Silverglate. The question should be, he says, whether charges are reasonable when they run counter to all human instinct and experience.